18 club members enjoyed a long weekend (January 10-13) at Afterglow Resort in Phelps, WI. 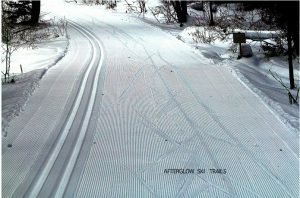 Great trails, plenty of outdoor activities provided by Afterglow including tubing, snow showing (snowshoes available to borrow) Ice skating (ice skates available to borrow), Hot cider around the campfire and lots of great companionship. Bay Nordic has reserved 3 cabins to accommodate up to 17 people. We are planning group pot luck meals. Thanks Luann for volunteering to organize meals! Note that Afterglow has a 3 day minimum stay. Registration: Email roberta.kozloski@sbcglogal.net for info on availability of space.